First Solar is the world’s leading producers of solar panels with a solar panel technology that differs from almost all of its competitors. First Solar Solar Panels use Cadmium-Tellurium Thin Film Solar technology, while the majority of the Solar Industry uses Crystalline Silicon Technology. Despite stiff competition from the silicon technology and most of the thin film companies going bankrupt, First Solar has managed to hold on cutting costs and improving yields continuously. 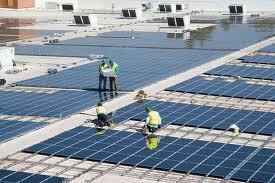 In fact First Solar used to have the lowest cost of solar panel production in the world. However with the cost of silicon solar panels crashing by the day, FSLR is now losing its low cost advantage. The company is thus working on increasing its Cd-Te technology efficiency. First Solar acquired General Electric’s (GE) thin film technology in return for 1.75 million shares of FSLR stock, making GE one of its top shareholders. The agreement includes the purchase of GE’s cadmium-telluride solar intellectual property. First Solar expects to be a winner by combining its manufacturing capabilities with GE’s IP. GE was giving a tight competition to FSLR in terms of cell efficiency, with GE’s efficiency at 19.6% as compared to FSLR’s 18.7%. Read more about First Solar’s Thin Film Solar Panels. GE has been in the power plant equipment business since a long time and has business relations with many utilities and developers. This would help FSLR market its products to the large solar farm industry. First Solar used to earlier sell its solar panels mostly to developers and utilities to build ground mounted solar panel farms. It remains to be seen if this GE-FSLR collaboration could enhance the panel efficiency which I doubt.